Neemrana's The Verandah in the Forest resort is a heritage property located in the lovely and scenic hill station of Matheran. Neemrana group of hotels have been popular across the country for preserving and exhibiting local culture and rich heritage of India through its experiential hotels. 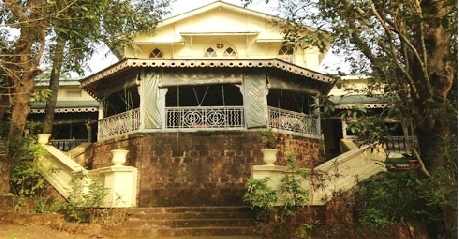 The Verandah by the Forest does exactly the same by offering a glimpse in the lifestyle and cultural specificities of reputed and respected Parsi or Hindu individuals or families from Matheran. Patrons can choose to stay at any of the 11 heritage rooms here, namely Elphinstone Deluxe Suite, Petit Grand Room, Sassoon Grand Room, Chenoy Grand Room, Kotwal Suite, Panday Grand Room, Jehangir Grand Room, Jeejeebhoy Grand Room, Kapadia Suite, Peerbhoy Room and Shankershet Room. All the rooms and suites are designed by experts keeping the simple and elegant old world charm alive while providing for all the necessary modern amenities and facilities. To cater to culinary requirements of the guests, there is a multi cuisine restaurant and a well designed dining hall, which serves Indian, Continental and Chinese gourmet delights along with host of local delicacies from the region. The hotel also has souvenir shop that offers merchandise like table linen, fashion wear and accessories, candles, pottery, silver plate and porcelain, tableware, flatware, tea sets, candle stands, trays and many more. The hotel also provides other generic facilities like transport arrangements, sightseeing arrangement, laundry facility, doctor on call service, currency exchange and many others. The simplistic charm and elegant beauty that surrounds this resort make the Verandah in the forest one of the finest heritage hotels in the region. Named after the Governor of Bombay who declared Matheran a hill-station; Elphinstone Deluxe Suite is one of the finest accommodation options available at the Verandah in the Forest resort, Matheran. This Deluxe Suite is quite spacious and offers ample amount of space for group travelers and families traveling together. The Elphinstone Suite embodies classy décor that is inspired by amalgamation of local cultural factors and elements that impart regal and imperial touch to the surroundings. The structure comprises of a large entrance room with study room included in it, two rooms with three plush single beds, and seating corner in the main living room area. The interiors are designed in such a way that they complement the surrounding natural beauty with the help of artistic paintings and sculptures. The premium furnishing, antique furniture and fine fit and finish augments to the overall opulent charm of the Elphinstone Deluxe Suites. To ensure that patrons have a wonderful time staying here, the suite is provided with several modern amenities and facilities like fruit basket, complimentary tea and coffee maker, two bottles of mineral water, iron and ironing board, dining table, hot and cold water availability, safety deposit locker and many more. The regal charm and opulent décor of the Elphinstone Deluxe Suite makes it stand out and apart from the other stay choices available in Matheran. Petit Grand Rooms is one of the most lavish accommodation choices available at e Verandah in the Forest resort, Matheran. 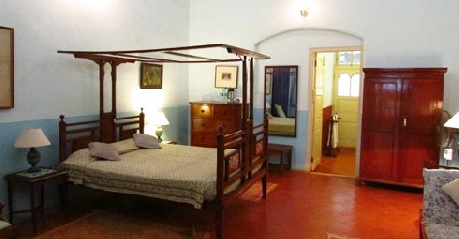 The room is named after Petit family – prominent Parsis of Mumbai and Matheran. Keeping their imperial tradition and rich heritage alive; the room is designed by experienced designers and decorators to offer it opulent and classy feel. The room consists of spacious bedroom with ample seating space, lavish bathroom and an outside verandah, where guests can relax and unwind, while enjoying the true beauty of nature. Antique furniture, premium fittings and classy furnishings enhance the regal charm of the Petit Room. There are local cultural elements that are borrowed from Parsi lifestyle adorning the walls of the Petit Grand Rooms. The room is provided with a plush antique double bed, old fashioned bathroom with washbasins in dressing room, fruit basket, complimentary tea and coffee maker, two bottles of mineral water, iron and ironing board, dining table, hot and cold water availability, safety deposit locker and many more. The charming décor and simple yet elegant feel and appeal of the Petit Room make it an ideal vacations stay option in Matheran. 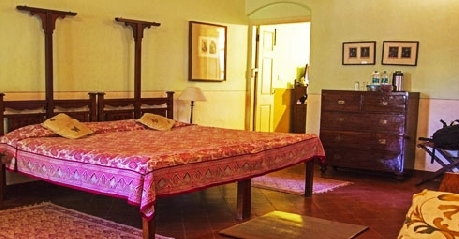 Named after a well known Jewish family Sassoon; this Grand room is a very popular accommodation option for guests traveling to Matheran for a family vacation. The room is designed by experts keeping in mind several requirements of modern day travelers. The Rooms sport very classy décor that is very simple yet elegant in its own unique way. The interiors are inspired from Parsi houseold style and their culture and it is clearly reflected in antique furniture, gracious furnishings and fine fittings included as part of Sassoon Grand Rooms. This Grand room is located on the verandah floor verandah skirting it on three sides and has two large single beds, seating unit, an all day bed and an antique almirah. Other amenities provided in the Sassoon Grand Room include fruit basket, complimentary tea and coffee maker, two bottles of mineral water, iron and ironing board, dining table, hot and cold water availability, safety deposit locker and many more. Opulent décor and simple interiors are the factors that make Sassoon Rooms stand out and apart from other options available in Matheran. Chenoys were a very prominent Parsi family, and this grand room is named after their glory and fame. The Chenoy Grand Rooms is a very popular accommodation choice for couples and small families traveling to Matheran for their vacation. The room consists of a spacious room that is adorned with premium furnishings, antique furniture and finest fittings. The décor the room is simple and inspired from the local Parsi culture, which is reflected with help of artistic portraits and paintings included in the Chenoy Grand Room. The Room also boasts of two large single beds, a study table unit, wardrobe and a Madame Recamier easy chair for the comfort of clients. Other amenities provided as part of the package with Chenoy Grand Room includes fruit basket, complimentary tea and coffee maker, two bottles of mineral water, iron and ironing board, dining table, hot and cold water availability, safety deposit locker and many more. The simple styling and old world charm of the Chenoy Grand Room is sure to impress both foreign and local guests who choose to stay there. Kotwal was a popular freedom fighter and martyr, who was executed in 1942 by the British. This suite has been named in his memory. The Kotwal Suite is a holistic vacation package that caters to diverse needs of modern day travelers. The suite is quite spacious in nature and unique architectural style and décor setup that impart opulent feel and appeal to the surroundings. The Kotwal Suite consists of two bedrooms that are interconnected by a single door and a red floored bathroom. Both the rooms are designed very aesthetically keeping in mind the local cultural values and elements of the people. The suite has very lively décor that is embellished classy interiors using artistic paintings, antique furniture and classy furnishings. Other amenities provided as part of Kotwal Suite includes fruit basket, complimentary tea and coffee maker, two bottles of mineral water, iron and ironing board, three single beds (one in small room, and two in large room), comfortable seating unit, dining table, hot and cold water availability, safety deposit locker and many more. The simple nature and ample space offered by Kotwal Suite makes it an ideal choice of stay for families and group travelers. Named after the prominent Hindu family of Matheran ‘ the Panday’; this grand room is one of the finest architectural marvels you will come across in the town. Designed by expert decorators, the Panday Grand room exhibits classy décor that is enhanced by presence of local cultural elements and simplistic embellishments. The antique furniture, premium fittings and artistic furnishings give the interiors very lively feel and ambience. The room also comprises of a wide and more private verandah area with direct access to the garden level and tree house. The classy interiors are further enhanced by cultural elements and artistic paintings that are included in the Panday Room. Patrons will also find other amenities and facilities provided in the room. The main among them include fruit basket, two single beds, complimentary tea and coffee maker, two bottles of mineral water, iron and ironing board, dining table, hot and cold water availability, safety deposit locker and many more. Classy décor and lovely view, these are the key features that set Panday Room apart and aside from other accommodation choices in Matheran. 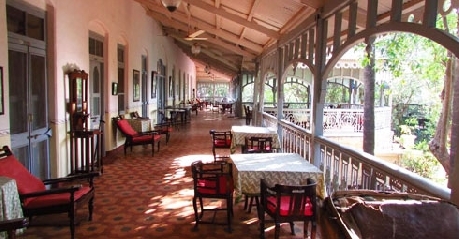 Named after one of the most reputed and respected Parsi families; the Jehangir Grand Room is one of the most sought after accommodation choice at the Verandah in the Forest Resort, Matheran. This Grand room is structured in unique fashion to retain its old world charm and simplistic décor, while providing for all the necessities and requirements of the guests. The décor is kept very simple and elegant with help of several cultural elements and symbols along with artistic paintings and gracious sculptures included in the room. Jehangir Grand Room is also provided with two 4 poster beds, a day bed, a writing desk and a wardrobe for the convenience of the guest. Other amenities that are included as part of the package with Jehangir room include fruit basket, two single beds, complimentary tea and coffee maker, two bottles of mineral water, iron and ironing board, dining table, hot and cold water availability, safety deposit locker and many more. The gracious nature and simplistic décor of Jehangir Room, makes it stand out and apart from other accommodation options in this hill station. Jeejeehoy is a very popular Parsi family known across the country and this room has been named after them. The Jeejeebhoy Grand Room is located on the garden level of the resort and offer unrivaled view of the surrounding natural beauty that is sure to impress both foreign as well as local guests. The spacious room has very simple but gracious décor that has typical old world charm that would transport the inhabitants to a much simpler time. Antique furniture, premium furnishing and fine fittings; add to the overall charm and aura of the Jeejeebhoy Rooms. The room is also provided with a plush and comfortable bed, seating unit and study table along with lavish bathroom. Patrons have also been appreciative of other amenities and features that are provided with Jeejeebhoy Grand Rooms. The main among them are fruit basket, two single beds, complimentary tea and coffee maker, two bottles of mineral water, iron and ironing board, dining table, hot and cold water availability, safety deposit locker and many more. If you are traveling solo or as a couple; this room would be ideal for all your requirements. Named after another prominent and respected Parsi family; Kapadia Suite is one of the finest accommodation choice available at the Verandah by the Forest resort in Matheran. The Kapadia suite is one of the few jungle suites available at the resort and offer complete privacy to guests choosing to stay there. The suite is located away from the main building of the resort and consists of two bedroom and ample seating space along with lavish bathroom. The first room is furnished with antique single bed, where as the larger room is provided with two plush and comfortable beds. The décor of the suite is designed carefully by experts in such a way that it complements the surrounding natural beauty. Other amenities provided as part of Kapadia Suite include fruit basket, two single beds, complimentary tea and coffee maker, two bottles of mineral water, iron and ironing board, dining table, hot and cold water availability, safety deposit locker and many more. If you are looking for a vacations spot where you can enjoy solitude and privacy; then this is your safest bet. 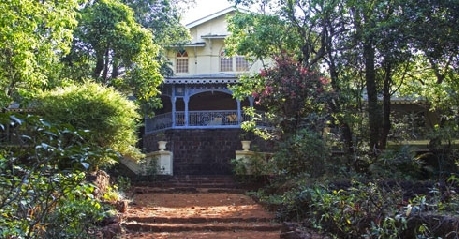 Named after the Bohra builder of the Heritage Train that was commissioned in 1907; the Peerbhoy rooms is a lavish and comfortable accommodation choice offered by Verandah by the Forest Resort in Matheran. The room is designed very thoughtfully by experts in such a way that it retains its old world charm while offering all the modern day amenities and facilities required by guests to enjoy a pleasurable holiday. The room consists of two decorative poster beds that rekindles the old world aura and takes guests back to a much simpler time. The room also has classy interiors that are enhanced by antique furniture, premium furnishing and super fine fit and finish. The room is provide with host of modern amenities and facilities to ensure that guests remain satisfied during their stay here. The main among them include fruit basket, two single beds, complimentary tea and coffee maker, two bottles of mineral water, iron and ironing board, dining table, hot and cold water availability, safety deposit locker and many more. Ideal for romantic couples and small families; the Peerbhoy room is sure to impress guests with its simplicity and charm. Located behind the bamboo groove on the premises of the luxury resort Verandah by the Forest in Matheran; Shankershet Room is one of the most popular accommodation choices available here. The room sports elegant décor that is inspired by the local culture and fused with modern design themes to give it a completely new look and feel. The interiors are decorated with antique furniture, simple yet elegant furnishing, premium fit and finish along with artistic paintings to give it very regal and imperial feel. The room is also provided with premium amenities and facilities like fruit basket, two single beds, complimentary tea and coffee maker, two bottles of mineral water, iron and ironing board, dining table, hot and cold water availability, safety deposit locker and many more. The simple nature and premium features of the Shankershet Room makes it a great vacation stay choice in Matheran. 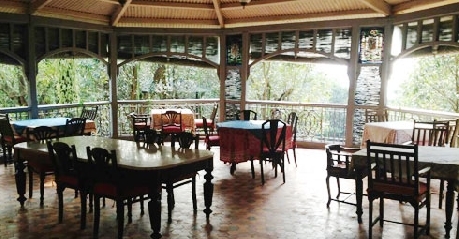 Savor delectable cuisine and regal hospitality while enjoying scenic sights of natural beauty that surrounds this lovely diner at The Verandah in the Forest in Matheran. The restaurant is located on the premises of the resort and therefore offers guests easy access to quality, hygienic and delectable food without having to venture out the hotel. The restaurant specializes in Indian, Continental and Chinese gourmet delights along with host of local delicacies from the region. All the food is prepared using organic ingredients and rare spices, which makes it very healthy. The local deliciaces have been hot favorites on the menu her because of their unique taste, that is brought out by traditional cooking techniques and use of rare spices and herbs. The unique ambience, regal setting and comfortable setting arrangement in the dining halls, make it an ideal venue for casual lunch outing or a formal dinner occasion. The attentive staff and quick service standards make this dining here a very pleasurable experience for guests.